Skiddaw: The Skiddaw mountain range forms the spectacular view from our bedrooms and garden. 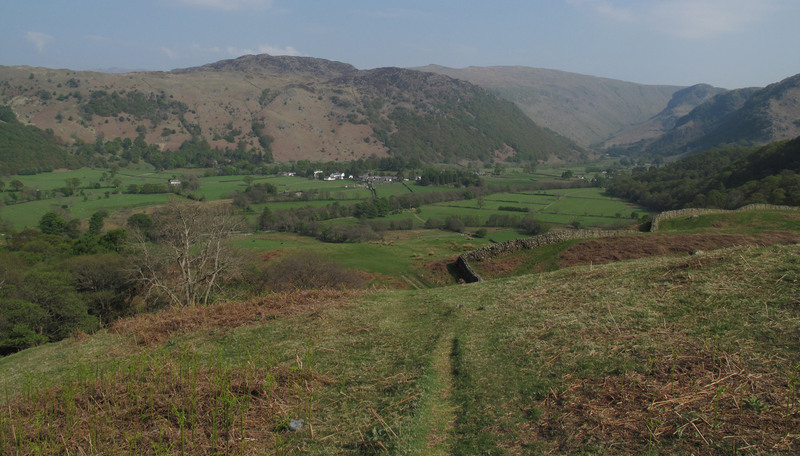 You can set out across farm fields from Thornthwaite Grange, to make your attempt on the summit of England's 4th highest peak. The Keswick Railway Path offers a gentle introduction to mountain biking. Sadly, the route was damaged during the 2015 floods, so please check their website for the latest uipdates on sections that have reopened. For the more experienced and energetic, there are numerous rides across the fells. Why not ride The Cumbria Way or the Skiddaw round? Whinlatter Forest England's only true mountain forest, it is home to the 19-kilometre red grade Altura Trail, recently recommended in The Times top 10 locations for Mountain Biking feature. The challenging route rises to an altitude of 500m, offering stunning views of the surrounding area. For intermediate mountain bikers, Whinlatter offers the Quercus Trail as well as many miles of forest trails. C2C The long distance Coast to Coast (C2C) Cycle Route goes right past our door. This is a wonderful route stretching from Whitehaven /Workington in the west, through the Northern Lakes and over the Pennines to Sunderland / Tynemouth on the North Sea. It is best tackled on a hybrid bike. For the Road cyclist, the Lake District offers the opportunity to cycle on quiet roads and lanes, but be prepared for some stiff climbs! Rock climbing is a popular sport in the Lakes offering challenges to beginners and experienced rock climbers alike. Climbing within the area ranges from V Diff [Very Difficult] to the more strenuous Extremes Climbs [E+]. One of the Lake's most popular climbing sites is Shepherds Crag at Borrowdale, just 20 minutes' drive away from Thornthwaite. There are also some incredible abseils throughout the Borrowdale Valley, one of the most spectacular is almost 100 feet above the ground at Woden's Face near to the Bowderstone. If you would like to try rock climbing or abseiling whilst in the Lake District, we can put you in touch with local companies offering courses and guided climbs. If you prefer to climb indoors, then the King Kong climbing centre offers the chance to try climbing walls, bouldering and even an ice wall. Instruction is provided and the experience is suitable for all ages and abilities. The National Nature Reserve of Bassenthwaite Lake is less than a mile from Thornthwaite and is renowned for bird watching opportunities. A pair of breeding Ospreys arrived at the lake in 2001 and continue to nest here - you can find out more about this project on the Lake District Osprey Project website. In addition to the ospreys, over 70 different kinds of birds migrate to Bassenthwaite to breed round the lake each summer. Derwentwater is an ideal location for water sports including sailing, canoeing and kayaking and is just a 5 minute drive from Thornthwaite village. Several local companies, including Derwentwater Marina and Platty+, offer equipment hire and courses on the lake. Ghyll scrambling or canyoning is an exciting adventure that is guaranteed to get you wet! How about a bird's eye view of the lakes? The Lake District is one of the top flying areas in Britain, due to the hilly and mountainous landscape. If you'd like to try paragliding, there are local companies who can offer courses, tandem flights and taster days. Or fly a gyroplane with an experienced instructor over the lakes and mountains. For those who like to get away from it all, the Keswick Canoe Company provide day courses on ‘bush craft’ and ‘self-sufficiency’.